Mother Teresa died this week on September 5, 1997 in Calcutta, India R 9:30 PM after a long full life at the age of 87. This occurred just six days after Princess Di’s unexpected death in Paris in a car accident with Dodi Fayed. The world had a double shock and jolt during this period of human instability from August 29 to September 16, 1997. During these span of days is a solar eclipse on September 2, a Moon Wobble (Sun conjunct Lunar Node) on September 12 and a lunar eclipse on September 16. Unexpected, major news events occur during these periods and eclipses have been studied and feared by the most ancient of astrologers around the world. Mother Teresa was born on August 26, 1910 at 2:25 pm in Skopje, Yugoslavia (41n59, 021e26). She was born into wealth but when her father died, the family was put into poverty. At the age of 18, she left home to become a nun in Dublin, Ireland. They sent her to India were she was not noteworthy until she was 36 when she received her inspiration and purpose going through a tunnel on a train on September 10, 1946 near Darjeeling. From that time forward, her goal was to serve the poor. Within two years she had separated from her religious order with Vatican approval to start her Missionaries of Charity. Note that she has Aries rising and the ruling planet of Aries is Pluto. Pluto is opposed to her MC. She was a pioneer and wanted to be her own boss, so she created a new order. This new order of her making has 5,000 sisters, 500 brothers and more than 4 million lay workers. She created 500 orphanages, leprosy homes and rescue centers scattered over 100 countries in five continents. She required that her sisters and brothers to live in poverty and learn English and the native tongue. Everyone was to sleep on a 2-inch thick cot. She was described by one of her biographers after her death as uncompromising, didn’t keep a bank account, small but powerful, iron-willed, and determined with a vision that was unstoppable. That description is very Aries. He thought she had the most powerful form of leadership — by being a living example. She cared for people individually that had been abandoned by all others in society. 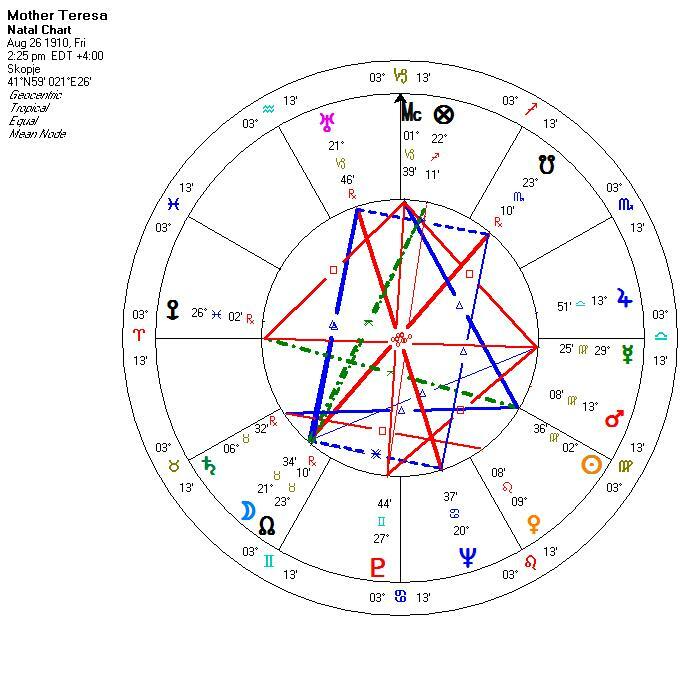 Mother Teresa was Virgo with Sun and Mars placed in the house of the sixth, associated with with the sick and illness. This was a hard working woman who was willing to do the basest work and be of service to humanity in service to her God. I place Pluto as ruler of Aries and it was on her Ascendant. This was the source of her strength and will power. These Pluto-Aries types need to strike out on their own. They rarely look back to their family of origin and many times leave home early in life. They have a strong need to lead and be in control of their own destiny. They can be empire builders in their ambition to achieve their goals. Their followers must conform to their standards and there is little compromise in their sense of what needs to be done. Note that her Sun, Moon, Pluto and Mars are all in mutable signs, the signs of social change and responsibility to others beyond self or family. With her purpose in place, she was not ambivalent but focused on humanity. Her orientation was to serve society and change it by serving the individual. Her Sun as in Virgo, the sign of service and practical solutions. Jupiter in Libra gave her a believe that all should be treated equally. Pluto in Gemini gave her the searing desire to be a light in the world of the most sordid squalor, disease and death on her own terms. Also note that her Mars at 13 Virgo was square the heliocentric nodes of Uranus which gave her the ability to have a surprise, unexpected element to many of the things she said or did. This knocked people out of their complacency. The interesting points on the day of her vision that pushed her out of the ordinary into the extraordinary was the transit of Uranus on her Pluto. Saturn was squaring her own Saturn and Venus. She was fed up with the established order she was in and the people she dealt with. Transiting Jupiter was close by to hit the same points in short order where she could consolidate her vision. Transiting Pluto was on her Venus. I would guess she longed to strike out in her own direction with fresh young faces. 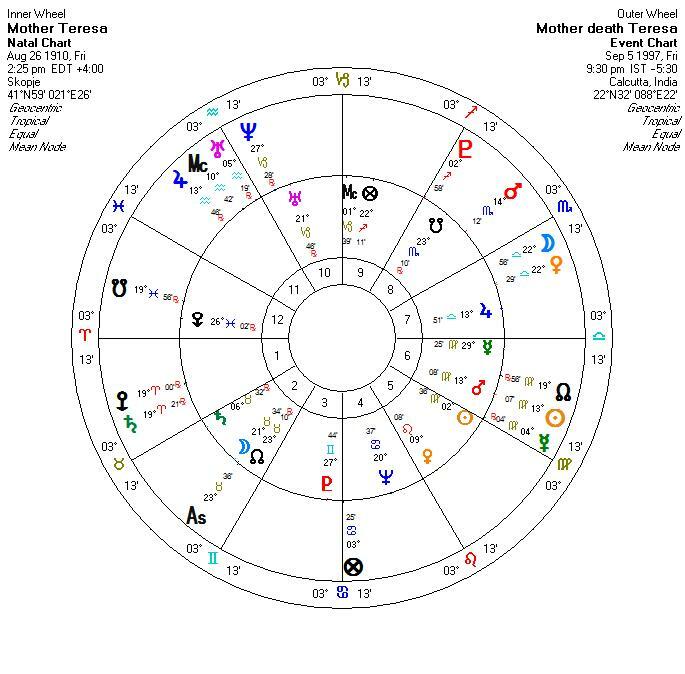 These were the long term trends she was in, but the very day brought Mars conjunct her Midheaven and transiting Sun and Mercury conjunct her Mars. Except for transiting Saturn that was stifling her, all the major aspects were conjunctions to her chart, i.e. expressions of self expansion and personal initiative. The day of her death does have the signature of sudden change and possible death. It was already known that she suffered from a serious heart condition and has been near death many times. This period brought transiting Uranus square her Saturn. This is a stress aspect for such an old person. Transiting Pluto was square her Sun, all difficult aspects to endure for long periods. The short term trigger aspect was this eclipse period. The transiting Sun was on her Mars and squaring the Nodes of Uranus. This is an aspect for sudden heart attacks out of the blue when accompanied with the other long term ones. References: Mother Teresa’s birthdata comes from Rodden’s “Profiles of Women” and astrodatabank.com. Her vision data was documented in her obituary article given by Dominique Lapierre and her death was announced by CNN and the Associated Press.